Play Buttons are part of YouTube’s Creator Rewards, and are a recognition by YouTube of its most popular channels. YouTube awards the Silver Play Button to channels which reach 100,000 subscribers and the Gold Play Button for 1,000,000 subscribers. The Diamond Play Button goes to channels who have attained 10 million subscribers. “Congratulations to the 32 new Gold Play Button recipients! This award is a testament to the hard work and persistence of our talented Thai creators. We look forward to seeing the new milestones you’ll achieve,” said Ben King, Google Thailand Country Manager. Thais love YouTube: Thailand is already one of the top 10 countries in the world for YouTube watchtime, and boasts a thriving and robust creator community. As of Feb 2017, Thailand now boasts 51 Gold Button channels (channels with over 1 million subscribers) and over 600 Silver Button channels (channels with over 100,000 subscribers). The Thai YouTube creator community is one of the world’s most vibrant, and in the past year alone, the amount of content uploaded to YouTube in Thailand has grown by 167%, while mobile watchtime in Thailand has grown 90% year on year. To support this incredible community of YouTube creators as well as the next generation of Thai talent, YouTube is excited to be bringing back a variety of initiatives to further support local creators, including its Pop-up Spaces, which came to various locations around Bangkok three times last year. 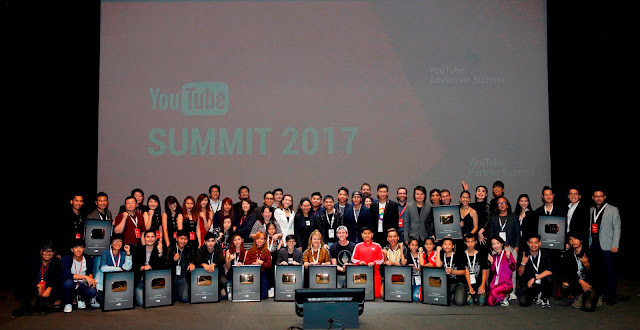 In addition, last year YouTube hosted its first class of Thai creators in NextUp — a program for developing up and coming creators, to whom we give grants for equipment, as well as production workshops and networking opportunities. Play Buttons adalah bagian dari penghargaan atas keberhasilan pencipta YouTube di YouTube yang telah diakui oleh YouTube sebagai saluran paling populer. Penghargaan dari YouTube dibagi menjadi 3 kategori berdasarkan saluran yang diterima.